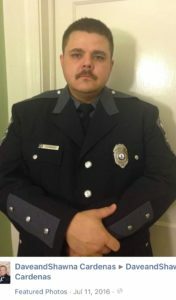 A resident of Chesterfield County, Virginia, Dan fulfilled the family legacy and became a police officer, his current posting as the School Resource Officer at L.C. Bird High School in Chesterfield. Dan has moved a lot recently, most recently appears to have been about 4 months ago with his fiance Abbie. His current address unknown. When not trolling in his CPD squad car, Morley can be seen out on the town in his black/gray 2007 Ford Mustang, license plate BRBRSA. Rob Stamm, formerly known as Robert Allen Goward, is a police officer with the Virginia Capitol Police. Capitol Police is the police force responsible for the Virginia capitol grounds in downtown Richmond, Virginia — in the area of the Governor’s Mansion and General Assembly. Rob Stamm has been among the cops policing the numerous, near-daily protests demanding that Governor Ralph Northam resign. He was present at the capitol at least during protests on February 4th and 5th. 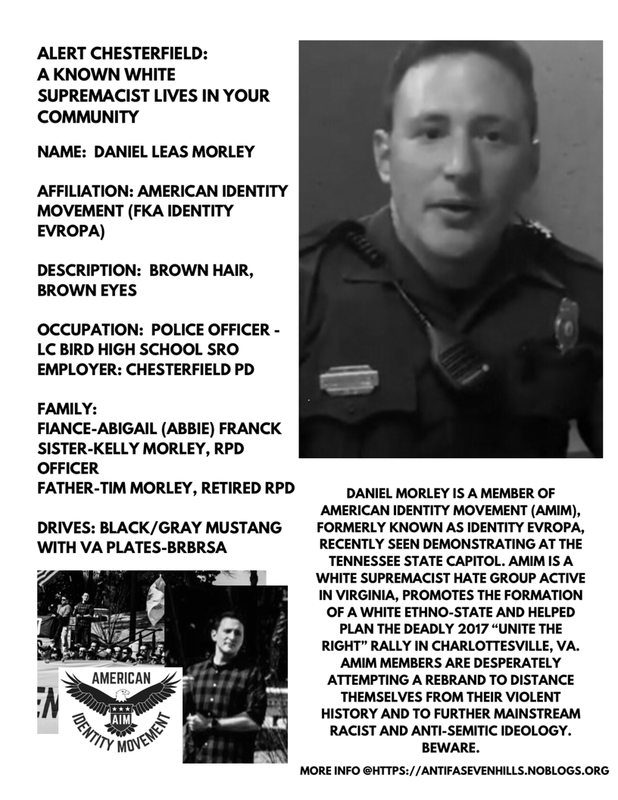 As detailed in this document, Officer Rob Stamm has explicit, overt ties to a white nationalist pagan organization, and an affinity for imagery, tattoos and Facebook pages associated with nazis and white supremacists. The Daily Stormer Book Clubs (DSBC) are a network of neo-Nazi cells spread throughout the United States, Canada and Europe. Begun on Andrew Anglin’s The Daily Stormer web forum, these groups have allowed white supremacists and fascists in different metropolitan regions to meet and coordinate racist intimidation and violence since 2016. The Portland, Oregon DSBC chapter (referred to in this article as the “PDX Stormers”) was until recently one of the largest and most active. Not only do they have a fluctuating membership in the neighborhood of 10 to 20 neo-Nazi participants, they have, more than other groups around the country, moved from the realm of the internet to real-world activities. Over the past couple years the PDX Stormers have carried out racist and anti-Semitic propaganda actions in the Portland metro area, in some instances targeting and then exposing even elementary school children to Nazi imagery. They have participated in a large number of Joey Gibson’s far-right rallies, and assaulted counter-protesters. In October of 2017, Pacific Northwest Anti-fascist Workers Collective publicized information about PDX Stormer Jarl Rockhill. 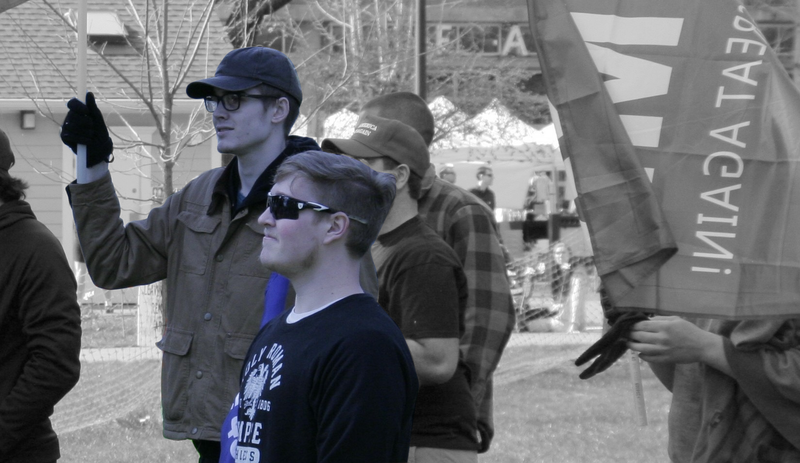 In February of 2018, Rose City Antifa publicized the identity of Vancouver, WA neo-Nazi Alexander Wolfgang Becker, also a member of the PDX Stormers. In the coming weeks, Rose City Antifa will expose the identities of three more PDX Stormers neo-Nazis: Matthew Blais, Bogdan Gerasimyuk, and Michael Dorsey. These three, along with Rockhill and Becker, represent the core of the most active and often seen neo-Nazis in the group. For updates, check rosecityantifa.org or follow along with the hashtags #stormerbreaker and #debaseddoxx. 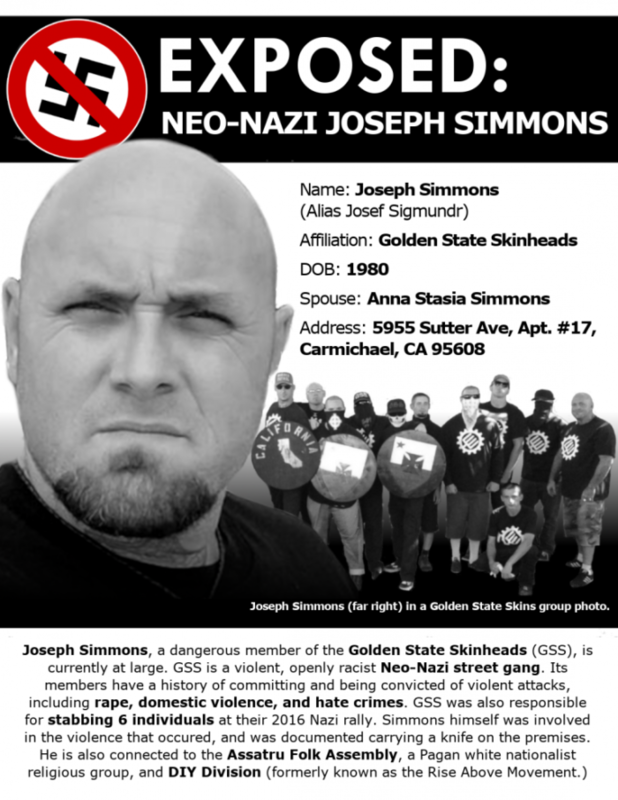 Joseph Ryan Simmons (AKA Josef Sigmundr) and his wife Anna Stasia Simmons (AKA Anna Sigmundr / Anna Lovesee) are two local white supremacists associated with the neo-Nazi gang the Golden State Skinheads (GSS). Joseph was one of twenty GSS members who participated in the infamous neo-Nazi rally at the State Capitol on June 26th, 2016. After the rally was canceled due to overwhelming opposition, GSS members brutally attacked anti-racist counter-protesters with knives and clubs , Joseph himself was carrying a knife on the Capitol grounds that day.